Indigo has launched RECO, the first iOS mobile application that provides users with access to a global community of friends and influencers to discover, share, capture, and discuss books through an easy-to-use and beautifully designed mobile experience. RECO’s book recommendations are curated and shared by a trusted community of friends and experts rather than through the impersonal suggestions of an algorithm, as is widely used by other services. Connect & Share: RECO allows users to share their favourite books in the app quickly and easily, complete with a beautiful cover image and short recommendation message. Users can post recommendations directly to Facebook, with additional sharing functionality through email, text, Twitter and LinkedIn. As well, users can publish complete book lists that anyone can subscribe to. Discover: RECO helps users find great books personalized to their interests, curated by friends and trusted experts. Upon sign-up, users are led through a “smart” personalization exercise to build their specific interest profile. Based on common interests, RECO helps users find and subscribe to curated book lists from experts and other booklovers who share similar passions. Further, over eight million books in RECO have been tagged with rich interest profiles to help users discover their perfect next read. Capture: RECO makes it simple for users to keep track of books they both want to read and have finished reading. Books discovered through recommendations from friends are captured in a simple, unified reading list. Users can also purchase books in any format directly from Indigo and Kobo in Canada, and the leading online book and ebook retailers in the US and internationally. Discuss: RECO provides users a place to discuss great books with their friends directly in the app. In addition, RECO has built a proprietary user matching algorithm that leverages individuals’ interests and RECO activity to introduce them to like-minded people. RECO has no interest in recommending books directly to users without context. Instead, RECO aspires to connect booklovers based on common interests, who will then go on to provide great book Recommendations to each other and spark new conversations. Indigo believes that books, more than any other medium, have the power to entertain, inspire and educate. Booklovers are continually in pursuit of their next great read and the mission of RECO is to cultivate a community of likeminded booklovers who motivate each other to read better books, more often. RECO already has a growing community of notable authors and influencers such as Margaret Atwoodand Neil Pasricha, with whom users can connect directly. The RECO iOS app was developed in close partnership with Toronto-based Retail Innovation Lab Kinetic Café and is the first new technology venture from Indigo since it founded Kobo in 2009. As one of Canada’s great tech success stories, Kobo became an early leader in the global eReading business, garnering millions of users around the world. In early 2012, just 23 months after Indigo launched Kobo, it was sold to Japanese online giant Rakuten for $315 million, and continues to operate as a leading global eReading company. Indigo’s successful experience with the creation of Kobo underscored the need to continue to invest in innovative experiences for booklovers, in every channel. RECO is now available fordownload for free on iOS devices through the app store, with an Android app coming soon. 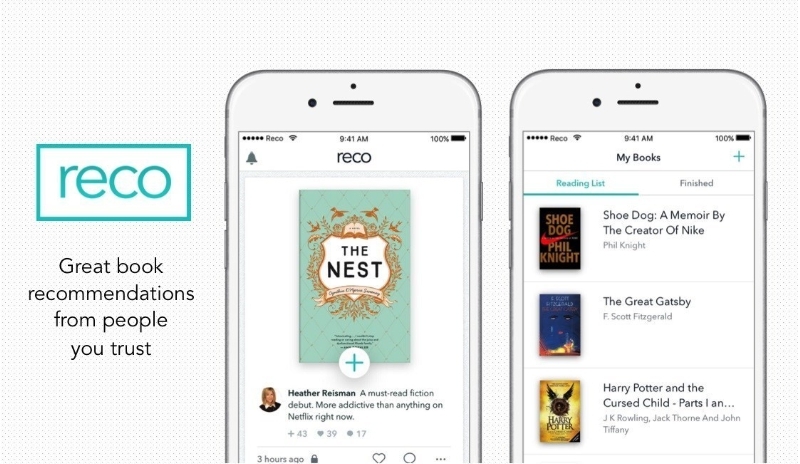 RECO is a social book recommendation platform built by Indigo, Through its free iOS app, RECO provides readers a place to discover, share, capture, and discuss great books through Recommendations from friends and trusted experts. RECO is a global platform that allows readers to purchase books in any format from a wide range of retailers, depending on region. To learn more about RECO, please visit RECO.com or download RECO for free. Hey Buddy!, I found this information for you: "Indigo Launches RECO, a Book Recommendation App". Here is the website link: http://shesinfluential.com/2016/07/21/indigo-launches-reco-a-book-recommendation-app/. Thank you.